You can purchase a copy of I Dare the Wave, A Life to Save here in MiniClicks online shop, you can also watch a video of me talking about the project below. Dave Sawyers is an incredible character, he has arthritis which makes it difficult to walk but as soon as he is in the water he has complete freedom of movement. 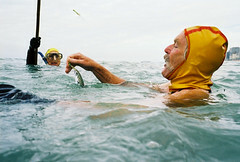 He also bought swishing to club which is the act of fishing while swimming, sometimes during a 45 minute swim he can catch up to 20 mackerel / horse mackerel. My publication includes images that have never been published on or offline before. It also includes photos, banners, posters and other items from Brighton Swimming Club’s historical archive that were recently digitized by the Floating Memories Project. I Dare the Wave, A Life to Save contains some previously unseen images deep from my archive. I Dare the Wave, A Life to Save also features material from Brighton Swimming clubs rich history which was recently Digitized by Floating Memories. The MiniClick publications are roughly 30cm by 20cm and are printed on uncoated paper. They have a very limited first print run of just 50 with half of those being held back for book fair sales. So there are only 20 available in MiniClick’s online shop once there gone you will have to hunt a copy down physically or by the complete set of all five books. 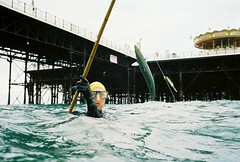 This entry was posted in Brighton, Photo Books, Published and tagged book, Brighton, MiniClick, swimming. Bookmark the permalink. 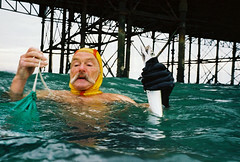 I’ve often wondered how you guys that swim in those freezing seas and don’t become suddenly ill due to the temperature? I guess it’s quite addictive due to the length you’ve been pursuing it. 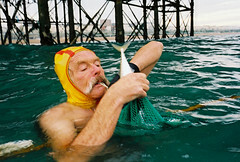 My favourite image from the video is of the guy catching the fish. I had to rewind the vid to see if really was a fish. They are indeed fishing. You can see those photos in my Flickr stream. Click on the images below to see them larger.